The global market for honeycomb packaging is expected to expand at a considerable rate in the near future due to its growing demand across several industrial verticals. The increase application of honeycomb packaging and emphasis on environment-friendly packaging are two of the key drivers for te global honeycomb packaging market. As the demand for protective packaging grows in end-user industries such as consumer goods, automotive, and furniture among others, the honeycomb packaging market will witness significant expansion. In light of these reasons, the global honeycomb packaging market is expected to reach a valuation US$14.1 bn by the end of 2024 from US$8.6 bn in 2015. Between the forecast years of 2016 and 2024, the global market is projected to expand at a CAGR of 5.7%. Honeycomb is gradually replacing bubble wrap, EPE, thermocol, EP foam, mineral wool, particle boards, rock wool, PUF, MDF, and wood in various packaging solutions. Thus, the rising focus on making packaging materials suitable to the environment and sustainable is expected to work in favour of the global market. Honeycomb packaging is gaining a strong foothold in a range of end-user industries that are in constant need of protective packaging. The report suggests that the emergence of e-commerce industry and the subsequent demand for transport of goods has provided the global market a phenomenal boost. This demand is largely a result of a need to protect damage and waste of items being shipped during transit. On the basis of packaging type, the global honeycomb packaging market is segmented into interior packaging, exterior packaging, pallets and others. Exterior packaging held a dominant stance in the global market as of 2015 and is expected to do so in the coming years as well. Exterior packaging materials refer to the outer containers and boxes in which the products are packed before being shipped and transported. They are the overall outer packaging which cover the entire product and help in safe transportation from the seller to the buyer. Exterior packaging includes, cartons, boxes, containers, and crates among others. This segment is also forecasted to grow at a steady growth rate owing to continued demand from end-user industries such as automobiles, furniture, and consumer goods. Other packaging type is forecasted to witness the most rapid growth rate over the forecast period. Trays and layer pads are in constant demand in order to provide cushioning and protection of goods while shipment. They are therefore, anticipated to have a rapid growth rate. Geographically the global honeycomb packaging market is segregated into North America, Europe, Asia Pacific, Middle East and Africa, and Latin America. North America led the pack in 2015 and is anticipated to have a steady growth rate over the forecast period. This is attributed to the large size of end-user industries in this region. Asia Pacific is also anticipated to register a significant growth rate in the coming years due to rapid urbanization and increased penetration of end-user industries in this region. The key players operating in the global honeycomb packaging market are DS Smith, BASF SE, Sealed Air Corporation, Sonoco Products Company, ACH Foam Technologies, Inc., Lsquare Eco-Products Pvt. Ltd., Smurfit Kappa Group, Packaging Corporation of America, WestRock Company, and Huhtamaki Group among others. 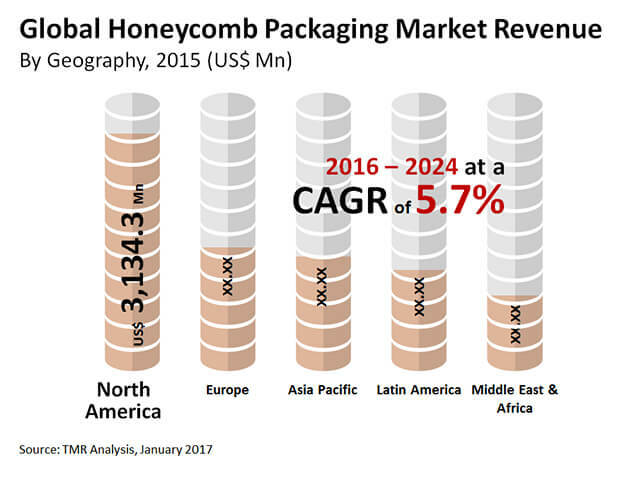 This report covers the analysis and forecast of the honeycomb packaging market on a global and regional level. The study provides historic data of 2015 along with forecast for the period between 2016 and 2024 based on volume (mn sq. mtrs) and revenue (US$ Mn). The study provides a decisive view of the honeycomb packaging market by segmenting it based on packaging type, end use and regional demand. Packaging type segmentation includes analysis on types of packaging used in honeycomb packaging and their future projections. End use segment includes analysis on various end user industries that uses honeycomb packaging and their current and future trends. The market has been estimated from 2016 to 2024 in terms of revenue (US$ Mn) and volume (mn sq. mtrs). Regional segmentation includes the current and forecast demand for North America, Europe, Asia Pacific, Middle East & Africa, and Latin America. These have been further sub-segmented into countries and regions with relevance to the market. The segmentation also includes demand for packaging type and end use in all regions. The report provides the size of the honeycomb packaging market in 2015 and the forecast for the next nine years up to 2024. The size of the global honeycomb packaging market is provided in terms of revenue and volume. Market revenue for regions is defined in US$ Mn and volume in mn sq. mtrs. The market size and forecast for each package type segment is provided in the context of global and regional markets. Numbers provided in this report are derived based on demand generated from different end user industry. Market dynamics prevalent in North America and Asia Pacific have been taken into account for estimating the growth of the global market.The study covers the drivers and restraints governing the dynamics of the market along with their impact on demand during the forecast period. Additionally, the report includes potential opportunities in the honeycomb packaging market on the global and regional level. The market has been forecast based on the amount of different types of packaging in demand. Demand for honeycomb packaging varies in each region as a result of the demand from various end user industries and different types of packaging in demand in each region. Individual type and end use have been taken into account while estimating and forecasting overall revenue and volume. Market estimates for this study have been based on revenue and volume. The factors for use of honeycomb packaging in each end use have been considered in calculating the revenue of the market. Demand for honeycomb packaging has been derived by analyzing the global and regional demand for honeycomb packaging in each end use. The honeycomb packaging market has been analyzed based on expected demand. Market data for each segment is based on corresponding revenues and volume. Factors considered for calculation of revenue and volume is drivers, restraints, and opportunities. Forecasts have been based on the expected demand from honeycomb packaging applications. We have used the top – down and bottom - up approach to estimate the market, split into regions. The application split of the market has been derived using a top-down approach for each regional market separately, with the global application segment split being an integration of regional estimates. Companies were considered for their product portfolio, revenue, and manufacturing capacity. In the absence of specific data related to the sales of honeycomb packaging of several privately held companies, calculated assumptions have been made in view of the company’s product portfolio and regional presence along with the demand for products in its portfolio. We have included competitive landscape of the market. The study encompasses market attractiveness analysis, wherein all the segments have been benchmarked based on their market size, growth rate, and general attractiveness for future growth. Porter’s analysis and value chain analysis is also included in order to determine the trend of the market. The report covers a detailed competitive outlook that includes market share and company profiles of key players operating in the global market. Key players profiled in the report include DS Smith, Sealed Air Corporation, Sonoco Products Company, BASF SE, ACH Foam Technologies, Inc., Lsquare Eco-Products Pvt. Ltd., Smurfit Kappa Group, WestRock Company, Packaging Corporation of America and Huhtamaki Group among others.